Of course, this has resulted in several over-excited and expensive shopping trips. Yes, I could wear the size 14’s which still (of course) fit, but I don’t want to! How have I achieved such marvels? Partly thanks to last year’s hysterectomy…I have a lot more energy than I have had for the past few years and walk miles each week. We still walk for a minimum of 45 minutes every day, usually after dinner in the evening, but we also walk a lot further some evenings and for hours at weekends. In addition I have dug out the stepper-exercise-machine-thingy, and jump on there whenever I feel the need. I am currently calorie counting, but in a really easy, no hassle way on www.myfitnesspal.com. It’s so simple and quick to use and I’m keeping it up daily. I know it is not a permanent or even long-term solution, but I’m hoping that while I use it I can learn to control portion size, cut down my junk/snack food habits and get a balance between food and exercise. It’s brilliant being able to see, with just a few clicks, how much exercise I really need to do to offset the chocolate ice-cream I couldn’t resist. I don’t feel like I’m going without anything I want, but treats are earned and it’s obviously working. That said, I have another stone or more to lose to get to a healthy weight/BMI. A is starting to complain that he can feel ribs and he doesn’t really want me to keep losing, but as long as I’m not unhappy he’ll support me. And knitting. The forest path stole is back in hibernation, simply because I am doing too many things at once and not making much progress on any of them. The other shawl I started last week is coming along nicely though, especially since I discovered that the pattern is simple enough to cope with while on the stepper! I have also completed some blanket squares. This is Crab. He is blue, and why not? Crab will soon be joined by Lobster, although my first attempt at Lobster came up way too small, so attempt 2 is under way with doubled-up yarn. Eventually the trio will be completed by a Funky Fish. For some reason I can’t settle on a single project though, every evening I spend half an hour on one thing then switch to something else for a short while. Not like me, but what does it matter? So, onto the week ahead…tonight we have Gethin. Work as usual. And not much else that I can think of. Fingers crossed it stays that way! 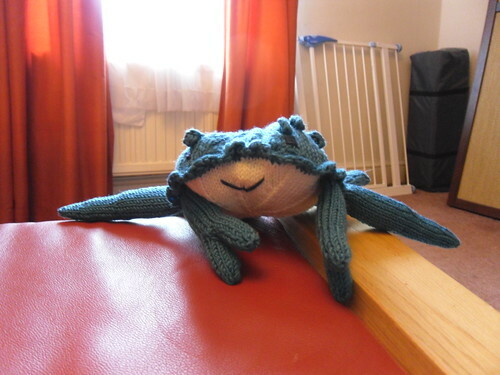 This entry was posted on July 16, 2011 at 10:27 am and is filed under Health, knitting. You can follow any responses to this entry through the RSS 2.0 feed. You can leave a response, or trackback from your own site.